How to use a static rope as a tether at the anchor of a top rope climb? I just recently returned from a course where we utilized a static rope to construct a top-rope anchor from a top-accessed ledge: the system was like that described in this answer - the resulting configuration of the rope being a "V" with an additional line running from one of the apexes turning the static configuration into an "N". The actual anchor legs are accomplishable via a number of means; however, when establishing the instructor tether, I am unsure of what knot is acceptable when going over the ledge and transferring to the pre-setup rappel. Typically, one leg is wrapped around a tree (I climb in the Southeast) and is secured with a Bowline (not enough for a tail). The length of the rope is run down to ledge and back to another anchor point (in this case a tree), creating the "V". What I've typically done is used doubled cordellete around the tree (redundancy) with an Overhand on a Bight. A locking carabiner is put through that Bight and the final leg is tied to that using a clove hitch. Is it appropriate to use the tail (on the right; as an example) of the adjustable hitch for my instructor tether? If not, how would you configure your use of the natural anchors to provide you with a tether for managing the site? Here is what I have done in the past and have demonstrated for others. Attach yourself to the tether with a Gri-Gri and tie backup knots beneath you to prevent a catastrophic failure of the Gri-Gri losing its grip and you sliding all the way down the rope. Its unlikely that the Gri-Gri would fail, but you still want to tie the knots in case and as good practice. The point of tieing the knots is that if the Gri-Gri were to slip, the knots would stop you from sliding past them. Just a simple figure-eight on a bight or an overhand on a bight will work (make the bights good and large). The Gri-Gri makes it really easy to go up and down the rope as you need and it means you don't need to constantly adjust knots in the rope. The backup knots are really easy to tie and they shouldn't get weighted, making them easy to untie. This seems like a dangerous setup for using a static rope. If the top right anchor fails as you are weighting the instructor tether, the instructor could fall a meter or so. On a dynamic rope, this is no problem, but on a static line, this could be dangerous. If there is enough tail left, I would probably connect the instructor tether to the center point, leaving a little slack between the clove hitch on the top right anchor and the eight on a bight (or whatever knot floats your boat) knot that connects the instructor tether to the center point. Not the answer you're looking for? Browse other questions tagged rock-climbing climbing-anchors top-roping or ask your own question. How do I set a top rope anchor? When rock climbing, what is the difference between top-roping and leading? How can I transfer my weight to a toprope anchor at the bolts? Top Rope Anchors - is a figure-8 on a bight stronger or just easier to untie than an overhand knot? 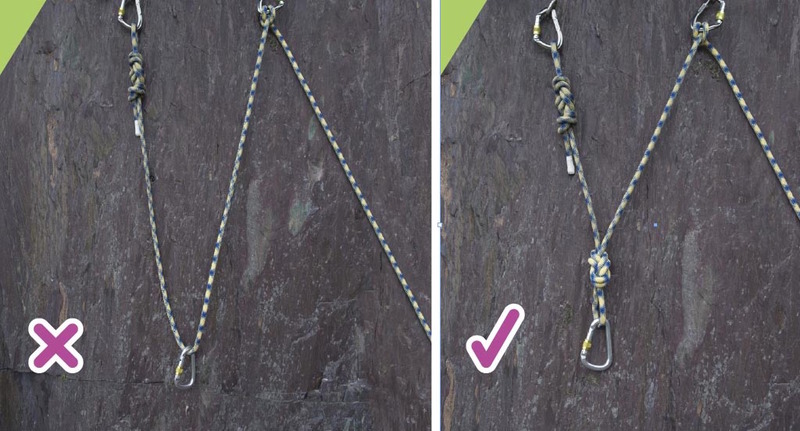 Which option should you use for a multi-pitch climbing anchor after traverse?